The Eucharist and the liturgy are together the very heart of Catholic spirituality. The Eucharistic Prayer is the liturgical prayer designed to help us enter into the Eucharist. Very few of the words are technically required (“this is my Body, this is my Blood” would confect the sacrament), but the prayers are there so that we can enter in. Entering in is no small thing. The sacrament makes Christ present no matter what we do. But it is only good for us to the extent that we let him into our hearts. Let us try to enter more deeply into the Eucharist. Let us better pray the liturgical prayers the Church gives us to do that. Part of the challenge of praying the Eucharistic Prayer is that there are so many words – we can lose the forest for the trees. We need to remind ourselves what each of those prayers is about. One way we can do that is by adding our own very short little summary prayers. While the priest says his many words, we can silently say a few, helping to guide our attention into his prayers. In other words, we can create an outline: we can look at the big headings to remind us what all the more minute details are talking about. The main four moments of the Eucharistic prayer are the epiclesis, the institution narrative, the anamnesis, and the doxology. Then comes the Institution Narrative, the story of the Last Supper. When the priest has said, “this is my body,” it’s traditional to say “My Lord and my God” (Dominus meus et Deus meus). You can enter into the prayer a little more by saying, “Body of the Lord, bread of life” (corpus Domini, panis vitae). When the priest says “this is my blood,” you can enter into the rich words of Jesus that he repeats by saying, “Blood of the Lord, chalice of the covenant” (sanguis Domini, calix testamenti). Immediately after we sing “the mystery of faith,” the priest says a very important but neglected prayer, the anamnesis. “As we celebrate the memorial . . . we offer you this holy and living sacrifice.” He lays the Body and Blood on the altar and says, essentially, “this is the sacrifice we offer.” You can remind yourself of this by saying, “Our sacrifice” or “Our offering” (oblatio nostra), or “for you, o Lord” (tibi Domine). And at the end, he prays, “through him, with him, in him,” the doxology. This is another sacrifice prayer: it says that we use the Eucharist to give “glory and honor” to the Father. You can say, “Glory to you, Father” (Gloria tibi Pater). Between the anamnesis and the doxology are several especially underappreciated prayers. They are less important than the four big ones (epiclesis, institution, anamnesis, doxology). But they are important: they are the central petitions the Church makes, the ones she lays on the altar of the Eucharist. They are petitions about the Church. They remind us that the Church comes from the Eucharist; the Eucharist builds the Church. 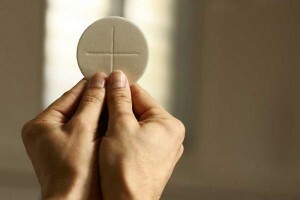 There’s lots of silly things people say about the Eucharist and community, but this is the real substance of how the Eucharist builds the Church – the Body of Christ builds the Body of Christ. These are in different order depending which Prayer the priest chooses. You will have to pay a little attention to figure out which one is being prayed. But you can do it – especially if you know what you’re listening for. One set of prayers is about the Church in this world. You can remind yourself how all these prayers are tied together by calling to mind, “the Church in the world” (Ecclesia in mundo). Another set is about “our departed brothers and sisters” who are still awaiting “kind admittance to your kingdom.” Here we recall, “the Church in purgatory” (Ecclesia in purgatorio). And the third set asks “that we may obtain an inheritance with your elect, especially with the most Blessed Virgin Mary . . . and with all the saints.” We recall “the Church in heaven” (Ecclesia in caelo). These short little prayers can help us keep track of what’s going on in the Eucharistic Prayer, and so enter into that prayer. And by entering into the prayer, we can more spiritually enter into the Eucharist, the Body of Christ. How do you pray the Mass? How could you do it better? Enter your email address to subscribe to The Catholic Spiritual Life and receive notifications of new posts by email. © 2019 The Catholic Spiritual Life. All rights reserved.